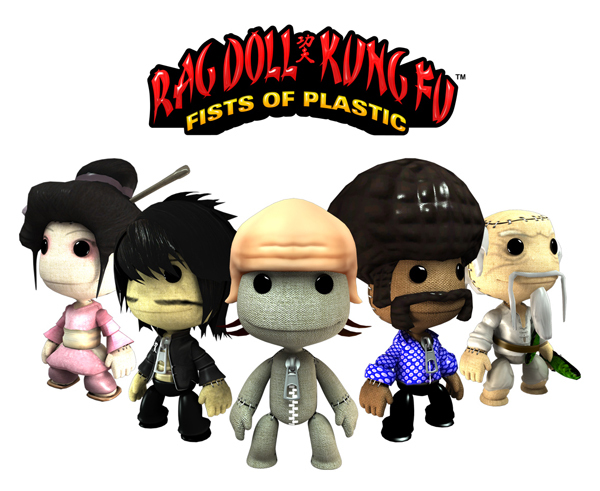 Our chums over at Sony have announced the DLC schedule for the rest of April, which starts tomorrow with a set of Rag Doll Kung Fu costumes. Rag Doll Kung Fu was a funky Indie game made by Mm co-founder Mark Healey, with help from various other co-founding folks, and was the catalyst that set the formation of Mm in motion. Tomorrow a sequel of sorts will be released on the Playstation Store, this time developed by our good friends Tarsier Studios. To celebrate the release we’ve made up this set of costumes based on the RDKF game characters. The pack includes somestickers too, and costs $5.99/€5.99 $2.99 /€2.99 / £2.39. That costume in the middle there is based on Mark Healey himself, who starred in the cut scenes of RDKF wearing this fetching rubber bald hat. Chi power!